My greenhouse didn’t survive last night’s storms. 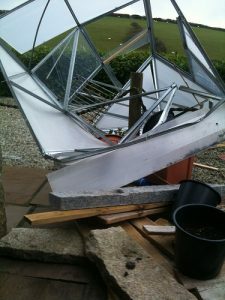 We had a few power outages, and the wind and hail were ferocious, but I didn’t expect to see my greenhouse looking like a battered box kite this morning. It was held down with long, granite slabs and was already missing panels on two sides, and I left the door open so wind could go all the way through. This worked for the 70mph winds… Not sure what happened last night, but it must’ve been awful. I called a local friend to help me bash out the remaining panels and to crush the metal frame into something resembling modern art. I’ve got a lot more cleanup to go, but the winds are still gusting fiercely and there is intermittent hail. The weather report on my usually trusty go-to site is not correct – I can tell from experience that when I have trouble walking upright, the winds are easily over 50mph right now. Clean up will be slow. My next garden plan will be a little different. Maybe I’ll stick to buying vegetables… and have a rock garden.